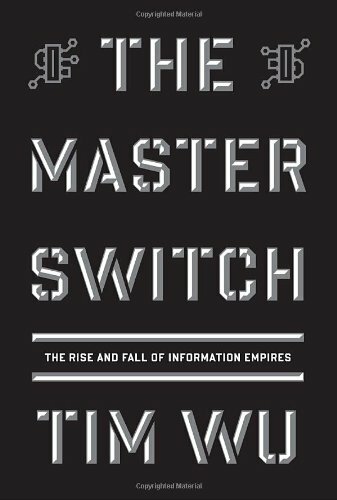 The Master Switch: The Rise and Fall of Information Empires, by Tim Wu. According to Columbia professor and policy advocate Wu (Who Controls the Internet), the great information empires of the 20th century have followed a clear and distinctive pattern: after the chaos that follows a major technological innovation, a corporate power intervenes and centralizes control of the new medium–the master switch. Wu chronicles the turning points of the century’ s information landscape: those decisive moments when a medium opens or closes, from the development of radio to the Internet revolution, where centralizing control could have devastating consequences. To Wu, subjecting the information economy to the traditional methods of dealing with concentrations of industrial power is an unacceptable control of our most essential resource. He advocates not a regulatory approach but rather a constitutional approach that would enforce distance between the major functions in the information economy–those who develop information, those who own the network infrastructure on which it travels, and those who control the venues of access–and keep corporate and governmental power in check. By fighting vertical integration, a Separations Principle would remove the temptations and vulnerabilities to which such entities are prone. Wu’ s engaging narrative and remarkable historical detail make this a compelling and galvanizing cry for sanity–and necessary deregulation–in the information age. A secret history of the industrial wars behind the rise and fall of the twentieth century’s great information empires—Hollywood, the broadcast networks, and AT&T—asking one big question: Could history repeat itself, with one giant entity taking control of American information? Most consider the Internet Age to be a moment of unprecedented freedom in communications and culture. But as Tim Wu shows, each major new medium, from telephone to cable, arrived on a similar wave of idealistic optimism only to become, eventually, the object of industrial consolidation profoundly affecting how Americans communicate. Every once free and open technology was in time centralized and closed, a huge corporate power taking control of the “master switch.” Today, as a similar struggle looms over the Internet, increasingly the pipeline of all other media, the stakes have never been higher. To be decided: who gets heard, and what kind of country we live in. Part industrial exposé, part meditation on the nature of freedom of expression, part battle cry to save the Internet’s best features, The Master Switch brings to light a crucial drama—rife with indelible characters and stories—heretofore played out over decades in the shadows of our national life.